Fair Park Deco is a fascinating tour of the 1936 Texas Centennial Exposition. Like every American exposition in the 1930s, it began in economic depression. Although the state’s economy had been buoyed by major oil discoveries in the early '30s, Texas agriculture was hard hit by the Great Depression. By the middle of the decade, state officials had set their sights on a great centennial celebration to help stimulate the economy and attract tourist dollars. The state’s centennial commission speculated that the idea of holding such a celebration on the one hundredth anniversary of Texas’ independence would have the effect of creating an optimistic spirit throughout the state. 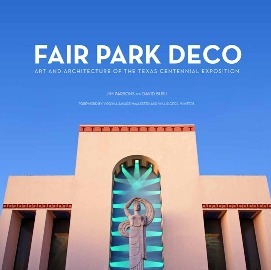 This book focuses specifically on the Art Deco art and architecture of Fair Park — the public spaces, buildings, sculptures and murals that were designed for the 1936 exposition. Most of the chapters in the book represent different areas of Fair Park, with buildings and artwork effectively arranged in the same order that a visitor to the Texas Centennial Exposition might have seen them. The art and architecture are featured in original photography by Jim Parsons and David Bush as well as in historic photographs. Fair Park is one of the finest collections of Deco architecture in the country, but it is so much more: the embodiment of Texan swagger, it is a testament to the Texanic task of creating a dazzling spectacle in the darkest days of the Depression. Jim Parsons is the director of special projects and walking tours chair for Preservation Houston. He also works as a freelance writer, editor, and photographer. David Bush developed his lifelong interest in historic architecture while growing up in New Orleans. He has worked professionally in preservation since 1990, primarily at Galveston Historical Foundation and Preservation Houston. David Bush and Jim Parsons have co-authored three books together, most recently Hill Country Deco: Modernistic Architecture of Central Texas, published by TCU Press in 2010. Debuting in January 2009, Authors in Architecture is a collaboration between the Houston Public Library Downtown and Architecture Center Houston (ArCH). Our aim is to create a dialogue between two downtown cultural centers and their patrons,while educating the public about current architectural issues.This series is free and open to the public. Special thanks to our media sponsor Houston Public Radio KUHA 91.7 and KUHF 88.7.